I'm kinda embarrassed. I really am. I think it's because I sometimes like to fly under the radar and don't like people to know all of my business. I like the element of privacy or just perhaps aloofness? I don't like being so predictable. And yet I am a creature of habit and comfort. 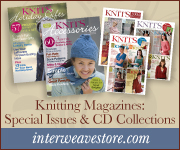 When it comes to knitting I usually am a Open Book, I'll tell you ALL about it and let you examine everything. This time, well I'm just a little shy to admit how this beautiful sweater came to be. In my grand defense I have just finished a wonderful and seemingly long Spring Break. I had a little over 10 days off and had originally scheduled those days as the "painting, cleaning, packing, moving around" days. Well, it seemed that mortgage companies don't go by any other schedule but their own and am still waiting for the final word. (homebuyers out there - ya feeling me on this craziness?) So I went to Plan B and did the next best thing - I knitted. I have been loving all the long coated cardigans I've seen lately and decided to design one for myself. I have been feeling the desire to design a sweater for a while now but have been a little too busy to really get it going. Hats and scarves seemed so much easier to try and create - sweaters just intimidated me. I did this one in a super easy peasy - no shaping - way and I am so thrilled with the result. I have always loved the Arrowhead Pullover pattern ever since I saw it on Eunny's blog a few years ago (can you believe I am saying years ago? Dudes, it was in 06!) 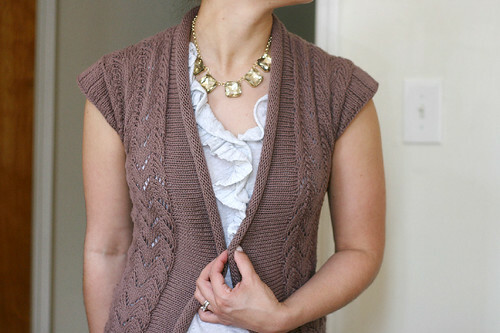 and decided to incorporate that stitch pattern into the design of my cardigan. Arrowhead is one of those deceivingly hard looking but ridiculously easy stitch patterns. It really opened up after blocking, too. Being that it was a summer sweater I naturally went for the summery yarn. Cottons and I have a weird love/like relationship. I love the end result but sometimes I just don't like knitting with it. It doesn't have any of the spring a wool does. You can't "flow" with it and knitting takes that extra little oomph... well, I hadn't met Blue Sky Skinny Cotton yet. I think that's pretty much all I want to knit with all summer long. Skinny Cotton cardigans, pullovers, throw pillows... you name it. Not to mention the array of colors are beautiful! That little knit funk I was in? Gone now. Thanks to this lovely frock and have you seen Que Sera? Hello, beautiful. So what's the big deal you ask? Why so embarrassed?? Well, um, what would you say if I told you I casted-on on a Friday and it finished blocking on a Wednesday?